Exercise is an important part of weight loss. 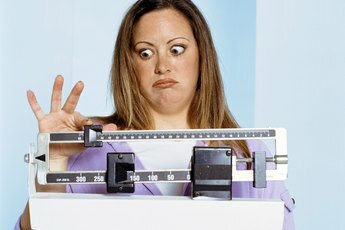 The only way for women to lose weight is to burn more calories than you consume. Once you drop excess weight and your muscles aren't covered with fat, toning them creates definition and improves strength. Cutting calories from your diet and increasing your exercise time helps create the calorie deficit necessary for effective and healthy weight loss. Including both cardiovascular exercise and strength training burns fat and tones your muscles. Talk to your doctor before beginning a new exercise and diet routine, particularly if you have any health conditions. Do at least 150 minutes of cardiovascular exercise each week. Stay at a moderate intensity for the most benefit. At this intensity, you'll be able to carry on a conversation, but will feel slightly winded. Spread this time out throughout the week. If you have difficulty losing weight, you may need to increase your exercise time to as much as 300 minutes each week because the guidelines are generally geared toward people at a healthy weight. Brisk walking, jogging, swimming, dancing and biking are good choices. Strength train at least twice each week. Lift weights or use resistance bands to work each of your major muscle groups. Take a day of rest between each strength training session to allow your muscles time to recover and build in mass. Strength training burns calories and works your muscles, which makes it important for weight loss as well as toning. Cut calories from your meal plan. Exercise is beneficial for weight loss, but the benefits are enhanced when combined with a low-calorie diet. In general, fill your place with a variety of foods from each food group, including fruits, vegetables, lean protein, whole grains and low-fat dairy. These foods are satiating, high in nutrients and usually low in calories. Measure and weigh your food for proper portion control. Use measuring cups and spoons and a kitchen scale to ensure that you aren't eating more than you realize. Even healthy foods can hinder weight loss if you eat too much of them and underestimate your calorie intake. Fruits, vegetables and dairy foods are measured in 1-cup portions and a serving of grains and protein is 1 ounce. Keep an exercise and eating journal. Record your workouts and meals, which allows you to see progress and holds you personally accountable for reaching your goals. Break your workouts into 10-minute chunks if you have difficulty blocking out 30 minutes or more at one time. This offers the same benefits, but makes it easier to get the recommended amount of exercise each week. How Much Should a 180-pound Woman Eat to Lose Weight? Is Peanut Butter Healthy to Eat?